Gently heat 1 tsp unsalted butter, 1 tsp maple syrup, 1⁄4 tsp ground allspice and 3 cloves (if desired) in a pan until smooth and combined. Turn off the heat, stir in 50ml Mount Gay Black Barrel Rum (or similar golden rum), then strain into a heatproof mug or glass. 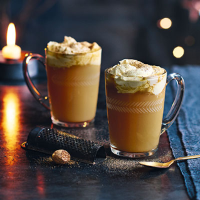 Top up with warm apple juice, and add some whipped cream and nutmeg for extra decadence. This recipe was first published in Fri Nov 06 14:41:00 GMT 2015.